You can add or customize line items for security deposits, damage waiver charges, etc. These would appear on all active orders that are in a drafted state and can be added either to the order total or as an independent value after the order total. Instead of adding custom entries manually, you can now automate the process of adding default line items to rental orders that are easily editable at order level as well. You can create these line items from Settings > Company Settings > Default Invoice Line Items. – How to Pay Security deposits and Damage Waivers? – How to Refund a Security Deposit? Many of our customers want to be able to track Security Deposits and Damage Waivers. For this, default line items are very useful. The process is now automated. Whether you require a security deposit for damages or a damage waiver charge towards a machine you rented out in case your clients damage the equipment before returning it. Apart from that, you can also add and customize another type of line item (as type ‘Other’) for rental orders. This line item behaves as a discount or extra charge you can apply to a rental order. Note: For this feature to work out, QuickBooks and Xero Integrations must be disabled. To do this, go to Settings > Company Settings > Default Invoice Line Items. – Choose ‘Security Deposit’ under the type drop-down field. – For example, you want to charge 15% security deposit on heavy car rentals, you can customize the line item to charge in percentage (%) on order gross total. An amount in $ can also be set (see image below). – Check ‘Include in order total’ to include this line item in the order total in the pricing table. There can be scenarios where you would like to add these line items to the order total before the taxes, coupons, and other discounts. OR just charge them separately other than the order total. Both the behaviors will be explained later in this post. – Hit ‘Create default invoice line item’ and the following dialogue will appear. – The same process can be used to create a default invoice line item for damage waivers. 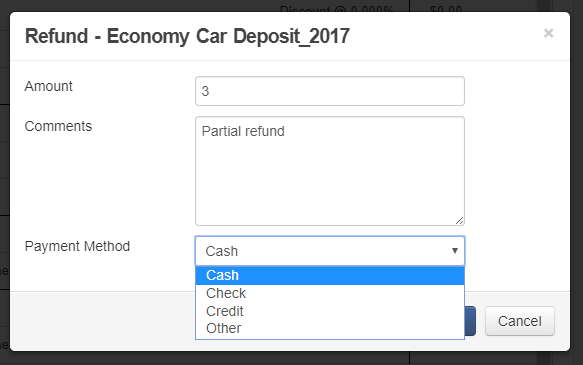 Choose ‘Damage Waiver’ under the type drop-down field. – Choose ‘Other’ under the type drop-down field. This type is used to either charge or apply a discount to rental orders. For example, 5% discount is applied to ski rentals during the summer break or $20 is charged for order handling during the holidays. – Like security deposit and damage waiver line item, you can customize the ‘other’ default line item to discount/charge in percentage (%) on order gross total. An amount in $ can also be set (see image below). Now this default invoice line item will appear in all the past and future drafted recurring orders. Note: Keep this setting unchecked if you want to display the invoice line item in the first order of a recurrence only. You can edit/delete a default line item from Company Settings > Default Invoice Line Items. By default, all line items are marked as active. However, you can deactivate a line item if it is not required at the moment or applied during the peak season. Note: All the default invoice line items (if marked active) will be added to all past and future drafted orders. In an order detail page, the default invoice line items will appear on the pricing table as shown in the image below. You can choose to remove default line items (security deposits or damage waivers) if not necessary for that rental order. As mentioned before, these line items are easily editable. You can change the values, however, the changes won’t impact the default line items configured in Company Settings. In the below image, you can see the behavior of both line items i.e. those marked ‘include in order total’ and the one not marked ‘include in order total’, which is shown at the end of the order pricing table. Default line items that are part of the order total can be synced to QuickBooks. However, default invoice line items that are outside the order total do not sync to QuickBooks. This is because QuickBooks does not allow for any line items outside the order total. If you still want to import these invoices, you will have to set all default invoice line item values to 0, or delete them and sync again. 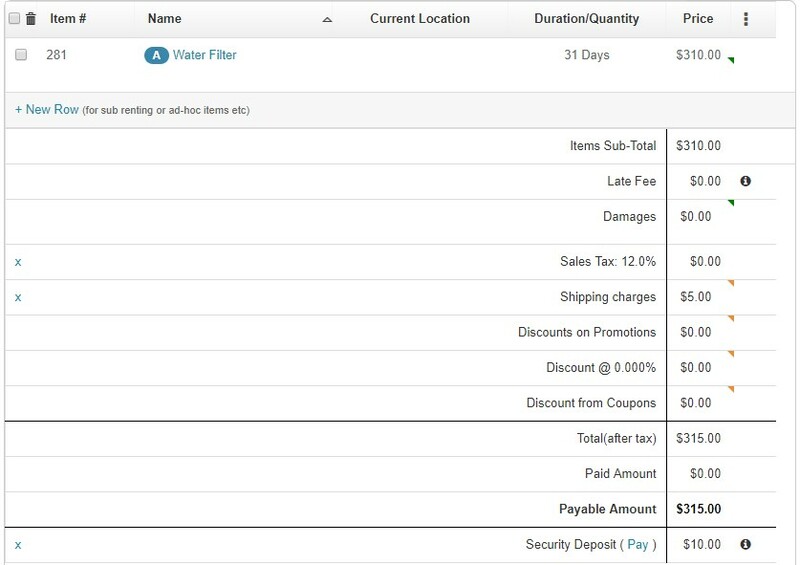 In this example, the Shipping Charges line item inside of the order total gets synced to QuickBooks. Whereas, the Security Deposit invoice line item outside of the order total will have to be set to $0 or deleted using the cross icon on the left in order to be imported to QuickBooks. How to Pay Security deposits and Damage Waivers? How to Refund a Security Deposit? To refund a security deposit, hit ‘Refund’ on the Order Details page, at the bottom of the pricing table (see image below). We recommend having the refund option enabled in Settings > Company Settings > Default Invoice Line Items, and the ‘Included in Order total’ unchecked. Note: Refund functionality only plays out for security deposits that are not included in the order total. Also, it appears in all the order states where a payment has been charged. An overlay will appear, where you can fill in the refund amount. You can only refund what was deposited as security. For example, if $5.60 was charged as a security deposit then only an amount equal to $5.60 can be refunded. A partial refund can also be made e.g. $3 out of $5.60; later $2.60 will remain as the outstanding refund amount. The default invoice line items will also appear in your order printouts. Learn More on customizing order printouts. There are a number of actions that you can take on an order. These action buttons are available on the right side of the order. Some of the most used actions other than Rent Out, Book and Complete order include Custom Entry (to record any price adjustment or service provided e.g. $10 extra for a guided tour, -$5 for issues in service etc. ), and Charge Payment (to record Credit Card and other payments). How to add a custom field to an order? How do I take a security deposit in case the rentals are damaged? EZRentOut is the proven equipment rental software used by SMBs all over the globe. Sign up today for a free 15-day trial. For more assistance, drop us an email at support@ezrentout.com. You can also share your ideas or visit our knowledge base and blog for detailed support posts. This entry was posted in [Support] and tagged custom entry, damage waiver, discount, invoice line items, security deposit by admin. Bookmark the permalink.